Read more about the key sustainable building features of the LRC here. Humber has introduced a wide variety of intelligent solutions for reducing energy consumption on campus. These green energy initiatives support Humber’s “triple bottom line” strategy by minimizing the College’s environmental impact, generating cost savings and helping to conserve the world’s non-renewable energy resources. For more information about Energy see our Energy and Climate Change page. Water conservation is an integral part of campus life. Find out more about Humber's water conservation initiatives here. Maintaining a healthy and safe environment for students, staff and faculty is a priority. Our cleaning program managed by Humber Facilities includes a comprehensive set of green cleaning and housekeeping initiatives that incorporate sustainability into Custodial Services’ daily operations. Disposable towels have been replaced with a standardized, colour-coded system of microfibre cloths. Most cleaning products are 100% biodegradable and minimize the use of packaging materials and water. Floor cleaning technology uses 70% less water than traditional scrubbing methods and eliminates the environmental impact of solvent use and disposal. Vacuums and other equipment are equipped with HEPA filters to minimize air pollutants and improve indoor air quality. Towels and toilet paper are 100% recycled paper. All products are from Ecolab and are Ecologo certified. All washrooms on campus have hand dryers eliminating the use of paper towels. The hand dryers are highly energy efficient, durable and hygienic. On a regular basis the Humber cleaning and food service staff are versed in recycling practices on campus. They are consistently asked for their feedback to improve cleaning, recycling and waste management on campus. 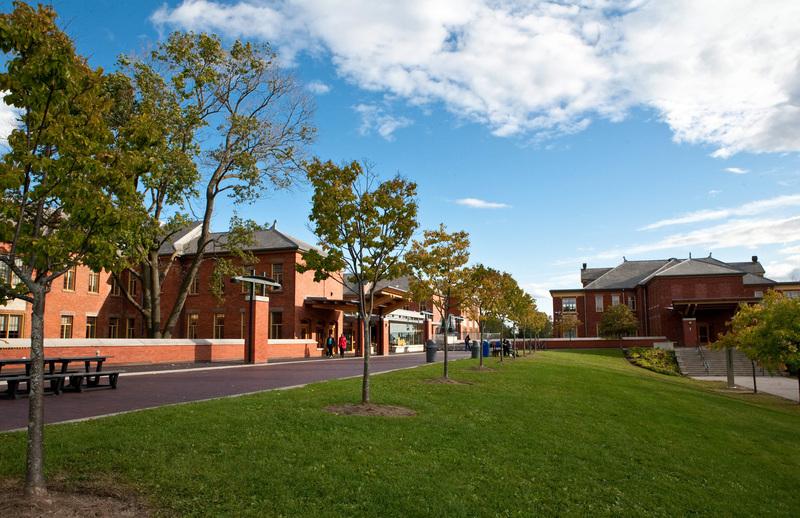 Humber's Lakeshore Campus is situated on the shoreline of Lake Ontario. The area is significant both for its natural landscape and for the Aboriginal peoples who lived here. It was a meeting ground for many aboriginal tribes. With its present-day parks, college and other local schools, the campus and the land around it continues to be a place of convergence and history. The east side of the campus was once home to one of Canada's largest psychiatric hospitals. In 1888 the "cottages" were built, designed to feel more home-like than traditional institutions. The institution was closed permanently in 1979 and 12 years after Humber College took on a longterm lease of the grounds and buildings from the Province of Ontario. Full restoration of the cottages and land started in 1993, including the underground tunnel system that was used to transport patients. Colonel Samuel Smith Park situated south of the Lakeshore cottages is one of Toronto's most diverse urban green spaces. It is home to a variety of plants, trees, birds and other wildlife, as well as a network of paths and an ice skating trail. The park is a designated Toronto Bird Sanctuary and listed as a Toronto Bird Hotspot. The waterfront lakefill areas are mainly naturalized with grasses, shrubs and small trees. The wetlands, woods, shore and meadow provide food, habitat and protection for the many species of plants, birds and animals that pass through or call it home. Humber College's North Campus is integrated with the 105 hectare Humber Arboretum, located in Adobigok (Place of the Alders in the Ojibwe Language). The Humber Arboretum is part of the Carolinian Life Zone (Ecoregion 7E), Canada’s most biologically diverse ecological region. It is home to 50% of Canada’s birds, 40% of Canada’s native plants, and 66% of our reptiles. Some 2,200 species of herbaceous plants and 70 species of trees are found in this zone. In 2015, the Humber Arboretum was designated as a new Environmentally Significant Area (ESA) by the City of Toronto. It is recognized in particular for its habitats for significant plant and animal species which are vulnerable, rare and/or threatened. Significant species at the Humber Arboretum include 21 species of flora, 20 species of fauna, 17 bird species, 2 mammals and one amphibian. Ontario Trails in the Arboretum highlights the Discovery Walk (part of the Toronto walks series of trails) loop through the West Humber River valley on a mixture of paved, hard-packed and grass trails.